Blogging effectively can not only improve your business, but it can BE your business. If your blog isn’t bringing in the traffic, the comments, or the money that you had in mind when you originally starting writing, then you are going to love this book by Problogger. It didn’t show me how to sell hundreds of paid advertising slots or get Seth Godin to comment, but it did teach me 31 simple steps I could take to improve my readers’ experience and thus excite them into becoming followers, commenters, and customers. This book covered 31 great topics (plus the 7 extra)! I had no idea there were so many ways I could improve my blog. My favorites were: analyze a top blog in your niche, 7 ways to identify readers’ problems, call your readers to action, and what 17 statistics to monitor on your blog. Each topic involved a single task but dozens of ideas kept popping into my head thanks to the extra notes provided. I also loved the fact that Darren Rowse included case studies of bloggers who had improved their blogs thanks to the first edition this book. In the end, I had a complete blog overhaul in the works. What makes Darren’s e-book unique? The book is broken down into 31 days (and 31 topics). Each day has a task, some teaching to help you understand the HOW and the WHY behind each task for the day, and further reading so you can dive deeper into the ideas. This made the book so much easier to tackle because I could take it one day at a time. While 94 pages is a bit to read, 3 pages a day is simple! On the 31st day, Darren helps you plan out what to do next. This is always the scariest part of any e-book or course because the support team, the safety net, and the motivation are suddenly gone! But this book walked me through some great tips for finding a blog buddy, creating a calendar, and sticking to my goals. He shared how to prioritize the tasks involved in blogging and, equally important, marketing your blog. I can’t say enough about this book. It really helped me take simple steps to excite my readers, boost my analytics and conversion rates, and made my posts get the comments and attention they deserve. If you’re blogging for your business, or your blog is your business, I would highly recommend taking the advice of Darren Rowse from ProBlogger. 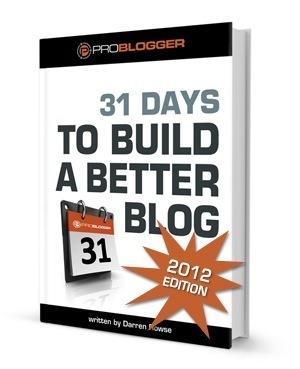 He put all his knowledge into 31 Days to Build a Better Blog. Plus, who wouldn’t want to build a better blog in a month? Agree. It is very helpful and thought provoking – with some good and action based ways to work on any type of blog. I was sceptical as so many of these kinds of ebooks about, but found his principles helpful. Like early on defining in one sentence what your blog is about and its uniqueness. That done helped me a huge amount!